Mary Sturtevant M. 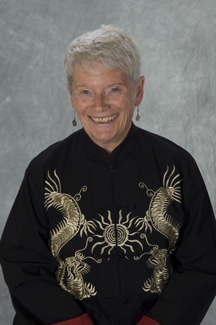 Ed., certified Reiki Master; certified Taiji instructor, certified Qigong instructor; student and practitioner of eastern philosophy, healing modalities and movement forms for over 30 years; embraced "Path of Harmony" as her work and spiritual path in 1994; teaches Reiki, Qigong, Meditation and Taiji; offers Reiki and Qigong healing treatments; practices Reiki and Qigong on a daily basis for health, healing and well-being; presents workshops nationally on the energies of Reiki and of Qigong; served on the Boards of Directors of the National Qigong Association and Guang Ping Yang Tai Chi Association. Served as chairperson of the Ethics and Integrity Committee of the National Qigong Association. Lao Shur is in the eighth generation of the Guang Ping Yang Taiji lineage and seventh generation in the lineage of Usui Shiki Ryoho. Lao Shur Mary Pabst, seventh generation Guang Ping Yang Taiji, from whom I learned the form; Lao Shur Diane Rabinowitz, sixth generation Guang Ping Yang Taiji, from whom I learned sword and fan forms; Grandmaster Y. C. Chuang, fifth generation Guang Ping Yang Taiji, form refinement, principles, ; Grandmaster Henry Look who introduced me to Yi Quan; Sifu Michael Johnson, from whom I learned weapons forms and the value of no-limit thinking; Master Yun Xiang Tseng, Daoist priest/healer/teacher; Francesco Garripoli and Daisy Lee, two extraordinary Qigong beings; Lao Shur Kenneth Cohen, from whom I learned Qi healing forms, Taiji Ruler and Hunyuan (Primordial) Qigong; Lao Shur Paul Mahoney from whom I learned Taiji Ball Qigong; Master Zhongxian Wu, from whom I experienced Shamanic Orbit Qigong. In China, I studied with Master Wan Su Jian, Madame Wang Yan and Master Jiang Nan—all very powerful Qigong Masters who shared several forms of Qigong. When I was tapped by Reiki in 1992, that became the very powerful and gentle source of my personal healing work. My Reiki mentor is Libby Barnett, sixth generation in the Usui Reiki Ryoho lineage of Dr.Mikao Usui. As a Reiki Master, I am dedicated to the principles and practice of Reiki on a daily basis. Similarly, I am dedicated to my daily Qigong practice for health, healing and well-being. I have experienced these practices as complementary modalities and each is vital to my process of being and growing.